Which State Has the Most Self-Reliant People? Back in 2010, I put together a “Moocher Index” as a rough measure of which states had the highest levels of welfare dependency after adjusting for poverty rates. My goal was to answer this question. Is there a greater willingness to sign up for income redistribution programs, all other things being equal, from one state to another? It turned out that there were huge differences among states. Nearly 18 percent of non-poor Vermont residents were utilizing one or more welfare programs, putting them at the top of the Moocher Index. In Nevada, by contrast, less the 4 percent of non-poor residents had their snouts in the public trough. Does this mean Nevada residents are more self-reliant and Vermont residents are culturally statist? To be perfectly frank, I don’t know, in part because the Moocher Index was an indirect measure of attitudes about dependency. 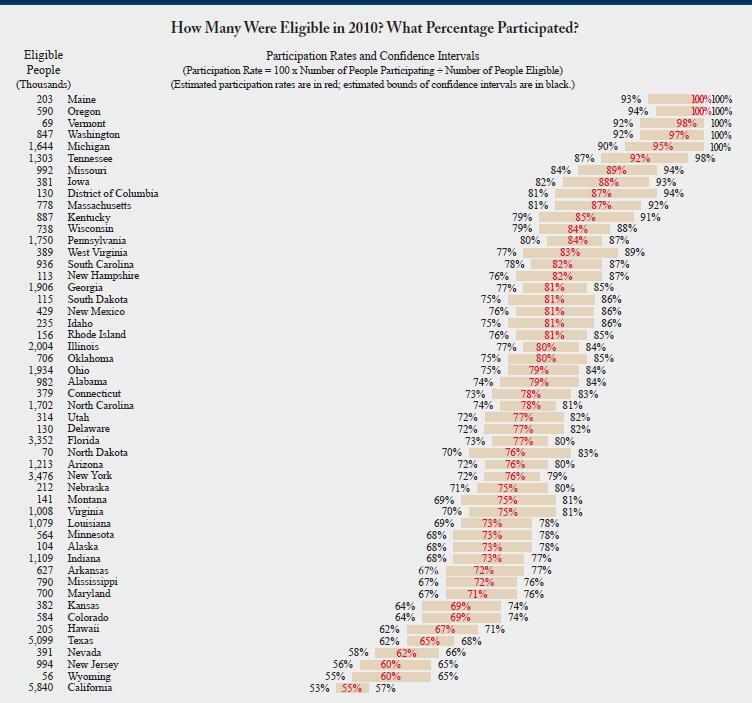 So I was very interested when I came across some state-by-state numbers from the Department of Agriculture showing food stamp participation compared to food stamp eligibility. There are some clear similarities between these food stamp numbers and the Moocher Index. Maine and Vermont are in the top 3 of both lists, which doesn’t reflect well on people from that part of the country. And Nevada and Colorado are in the bottom 10 of both lists. But there’s no consistent pattern. Mississippi and Hawaii are in the top 10 of the Moocher Index but bottom 10 for food stamp utilization. What really stands out, though, is that the people of California win the prize for self reliance, at least with regard to food stamps. Only 55 percent of eligible people from the Golden State have signed up for the program. Doesn’t make sense when you look at some of the crazy things that are approved by California voters, but I assume the numbers are accurate. I’m also surprised that folks from New Jersey are relatively unlikely to utilize food stamps. On the other hand, why are Tennessee residents so willing to use my wallet to buy food? As you can see from the map, they not only have a very high participation/eligibility rate, but also have one of the highest overall levels of food stamp dependency. Oregon, not surprisingly, always does poorly, whether we’re looking at a map or a list. Let’s close with a few real-world examples of what we’re getting in exchange for the tens of billions of dollars that are being spent each year for food stamps. Using food stamps to buy luxury coffee at Starbucks. Buying steaks and lobster with food stamps. The Obama Administration rewarding states that sign up more food stamp recipients. Proposals to make it easier to use food stamps at fast food restaurants. College kids scamming the program for handouts. New York City giving food stamps to newly released prisoners and running foreign-language ads encouraging more people to sign up for the program. The Octo-Mom mooching off the food stamp program. The Agriculture Department running radio ads to lure more people into food stamp dependency. With stories like this, I’m surprised my head didn’t explode during this debate I did on Larry Kudlow’s show. on April 19, 2016 at 7:43 pm Which State Has the Most Self-Reliant People? I work at a Grocery Store and see how much food they get and it was way more than I ever had to support 3 kids. Also, I have them getting $200. wedding cakes on food stamps. on December 21, 2013 at 4:24 am Instead of a Government-Guaranteed Income, How About a Plan to End the Welfare State? I am stunned that your “Moocher Index” doesn’t show DC, NYC, VA, and MD to be at the top. I’m less troubled by people getting food stamps than I am by the crony capitalists and their political class co-conspirators who take the country for trillions. I wonder if this could have something to do with the size of the underground economy. Both Texas and California have a huge number of illegals and a large and thriving underground economy. Accounting for that would change the denominator, reducing the actual number of eligible. While still legally eligible, it’s possible people who don’t actually need food stamps won’t bother with the hassle of it if they don’t need to. The real question is the definition of “poor”. If you have a microwave, TV, cable, cell phone, A/C, and obesity is your major health problem, how does the “Nanny” figure you are poor? I’ve been to enough third world countries to know what poor really is.